One of my many fresh pineapple juices enjoyed by the pool. 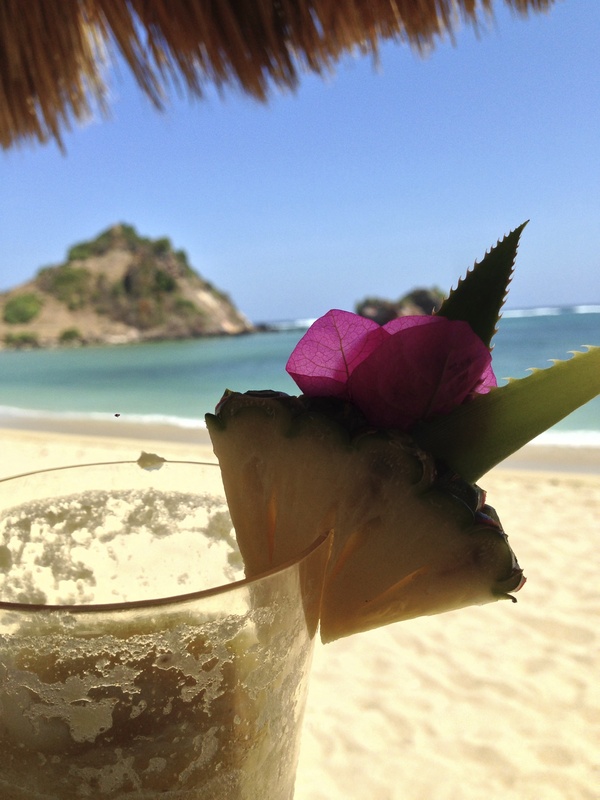 Lombok is the less bragged about of the islands in Indonesia, and I can’t figure out why. In my opinion, it has the potential to surpass Bali’s appeal in the coming years if people take notice accordingly. The persisting culture of the indigenous Sasak people, unspoiled beauty, pristine beaches, waterfalls, active Mount Rinjani volcano and less crowds make Lombok equally interesting and just as beautiful. Often times, Bali overshadows the arena of conversation concerning Indonesia’s stunning islands, but for us it was a perfect change of pace after being on the go in busy Java and Bali. We decided to finish off our 16-day trip within Indonesia on Kuta beach in the south of Lombok. This part of the island boasts a real island charm with local warungs, young backpackers and surfers soaking up the sun, relaxing by the impressive waters and having a beer or two. Less people come to Lombok as it’s nothing like Bali and lacks an abundance of western luxuries. Personally, I would recommend Lombok to anybody who wants a relaxed, less crowded holiday, where they can venture out on their own with a motorbike or car to cruise the beautiful coastlines. In our case, being in a place like Makassar made us miss the little comforts and big luxuries of the west, so we opted for a hotel that could offer luxury, a nice in-between. We chose The Novotel, a frilly resort located on Kuta Beach giving us the option to stay in the resort with its many facilities or venture out into the local villages and get a taste of the real Lombok as we wished. We went into town for most meals with our rented motorbike since the meals were not mind-blowing and a bit over priced at the hotel. The highlight of my time was being wedged between the two hills on the private beach while enjoying the view on the lounge huts that lured me in for hours each day. When we got tired of being lazy (which was rare), we’d hop on a motorbike to each casual yet delicious meal and explore seaside villages to pass the time. This getaway served to remind me of the little things and how much they’ve been missed after living in a city like Makassar- a comfortable big bed, fresh air, less pollution, English speakers and of course, amazing food. All in all, all I know is that the minor stresses fall away with each getaway like Lombok and make it a bit harder to go back to routine life in Makassar. The contrast is stark and beautiful as I can feel myself appreciating the little things more and more. Laurens enjoying one of the many pools at the Novotel. The Novotel grounds are decorated in traditional Sasak decor and have tribal statues lining the walk ways. A rickety bridge amidst the arid terrain near the Novotel. This birdcage carrier impressed me. While driving along the coastline we found this abandoned house touting such an incredible view. Little did we know a man would walk in later with a machete in his hand pretending to live there. He was friendly but it was clear he wanted to intimidate him so we’d have no choice…He pushed to take the following pictures so of course we paid him a little something and got out of there fast! Feet hanging over the edge, wouldn’t mind if this were my house. For someone who is terrified of heights, I’m proud of myself! This slab hung high above the Bali Sea below.